Would you like a full-body workout without leaving home? These Sole Ellipticals may be just what you want. They provide an intense cardio workout and strength training all at once. Let’s look at the features of each elliptical machine and see which one is the right fit for you. Especially for the special editions from Sole E55 and E95, the best units of Sole. They are standing with similarities and differences that will explain and mention clearly enough on the following below. 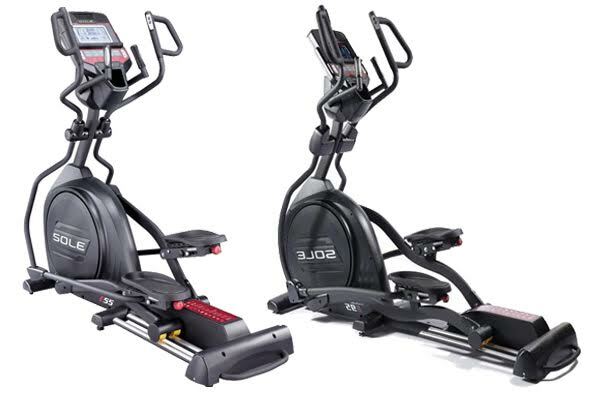 The Sole E55 is featured with a choice of 20 elliptical paths, trainees can accomplish impressive muscle toning that’s not possible with other elliptical trainers, LCD 9 inch with a high contrast, and a tablet computer or smartphone as its monitor. Also, there is bluetooth to set up a workout through your mobile device, use favorite apps for entertainment or multitasking, and then export your workout stats to any compatible fitness app. There are 10-item workout menus. Each workout can control the elliptical machine’s resistance and incline. The choices are manual mode, five standard elliptical workout programs (Cardio, Fat Burn, Hill, Interval and Strength), two heart rate controlled workouts, and two programs created and saved by the user. For extra motivation it’s iPod compatible; speakers and an MP3 player port are included For heart rate monitoring the elliptical is compatible with a wireless chest strap. It also has contact pulse sensors. Both SOle E55 and E95 are the most expensive units from Sole’s brand. Beside the price which stands differently to each other, another differences are existed on the E55 which is a little lighter so this is going to contribute to a less stable frame compared to the E95. As a result, if you’re a heavier user, you’re going to find the heavier Sole E95 a better fit for you. One more thing, the console is also different because, the Sole E95 has two colors (red and green) compared to only the one color on the E55 (blue). You’ll also find that the message window below the profile matrix can fit 20 characters on the E95 compared to the 12 on the E55.